A residential area is a land used in which housing predominates, as opposed to industrial and commercial areas. Housing may vary significantly between, and through, residential areas. These include single-family housing, multi-family residential, or mobile homes. Zoning for residential use may permit some services or work opportunities or may totally exclude business and industry. It may permit high density land use or only permit low density uses. Residential zoning usually includes a smaller FAR (floor area ratio) than business, commercial or industrial/manufacturing zoning. The area may be large or small. Residential areas may be subcategorized in the concentric zone model and other schemes of urban geography. Residential development is real estate development for residential purposes. Some such developments are called a subdivision, when the land is divided into lots with houses constructed on each lot. Such developments became common during the late nineteenth century, particularly in the form of streetcar suburbs. Post–World War II economic expansion in major cities of the United States, especially New York City and Los Angeles produced a demand for thousands of new homes, which was largely met by speculative building. Its large-scale practitioners disliked the term "property speculator" and coined the new name "residential development" for their activity. Entire farms and ranches were subdivided and developed, often with one individual or company controlling all aspects of entitlement (permits), land development (streets and grading), infrastructure (utilities and sewage disposal), and housing. Communities like Levittown, Long Island or Lakewood south of Los Angeles saw new homes sold at unprecedented rates—more than one a day. Many techniques which had made the automobile affordable made housing affordable: standardization of design and small, repetitive assembly tasks, advertising, and a smooth flow of capital. Mass production resulted in a similar uniformity of product, and a more comfortable lifestyle than cramped apartments in the cities. With the advent of government-backed mortgages, it could actually be cheaper to own a house in a new residential development than to rent. As with other products, continual refinements appeared. Curving streets, greenbelt parks, neighborhood pools, and community entry monumentation appeared. Diverse floor plans with differing room counts, and multiple elevations (different exterior "looks" for the same plan) appeared. Developers remained competitive with each other on everything, including location, community amenities, kitchen appliance packages, and price. Today, a typical residential development in the United States might include traffic calming features, such as a slowly winding street, dead-end road, or looped road lined with homes. Suburban developments help form the stereotypical image of a "suburban America," and are generally associated with the American middle-class. Most offer homes in a narrow range of age, price, size and features, thus potential residents having different needs, wishes or resources must look elsewhere. Some residential developments are gated communities. They do not mesh well with the greater community. 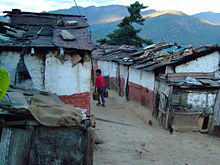 Some are isolated, with only one entrance, or otherwise connected with the rest of the community in few ways. Being commuter towns, they serve no more purpose for the greater community than other specialized settlements do, and thus require residents to go to the greater community for commercial or other purposes. Whereas mixed-use developments provide for commerce and other activities, thus residents need not go as often to the greater community.